Prepare to be dazzled by the sparkling jewels that you’ll be spinning in on the Jewel Strike slot machine from Blueprint Gaming as you are tasked with collecting yellow sapphires, red rubies, blue sapphires and green emeralds for massive rewards of up to 125,000 credits! With a structure of 5 reels and 10 fixed paylines, you may be thinking Jewel Strike is yet another run of the mill traditional slot but the avid Blueprint Gaming slots players amongst you will know that they don’t do things by half like so many slots developers do. 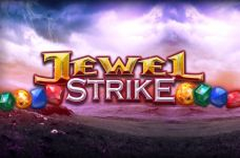 Instead, Jewel Strike will lavish you with dazzling wins thanks to two special features. These are the Colossal Reels feature which is triggered randomly and sees a large 3x3 symbol appear on the reels and the Epic Spins feature which can be activated at any time with you paying a fee to spin the reels while removing lower valued symbols in the hope of scooping a big shiny win. Combine this with the dreamy background which will instantly put you at peace, the mesmerising soundtrack that promises to keep you enthralled in the action, the very generous return to player percentage of 96.10% and the fact that it offers affordable stakes of 20p up to £25 to suit everyone and it’s safe to say it’s time to strike the reels! The glitz and glam lifestyle of the wealthiest in society is on full display across these five reels with dazzling jewels falling into view to deliver wins that are just as dazzling, with the most valuable combination on the paytable guaranteeing you new-found status in the wealth department to ensure you can drape yourself in the jewels rather than looking on in awe. That combination is a yellow sapphire landing on each and every position on the reels which will deliver an incredible win worth 5,000x your stake. While you may think this is some kind of special symbol you’d actually be wrong as there are no Wild or Scatter symbols included in Jewel Strike. Instead the yellow sapphire, which is worth 500x your stake for five on a single line, is accompanied on the reels by red rubies that are worth up to 40x your stake, blue sapphires and green emeralds that can bring up to 30x your stake, Ace and King symbols that are worth up to 20x your stake and Queen, Jack and 10 symbols complete the range of symbols that you’ll spin in on these reels bringing rewards of up to 10x your stake each time. Blueprint Gaming are famous amongst slots players for their incredible random bonus features and Jewel Strike also boasts one – a very lucrative one at that. It’s named the Colossal Reel and it can be triggered completely at random during any spin. You’ll certainly know when it triggers as a massive colossal symbol, which takes up nine symbol positions in a 3x3 grid, appears on the reels to guarantee a win on every line, and if the two other reels contain a symbol which matches it you are in for a quite sensational win. This is certainly the easiest way to scooping that top prize of 5,000x your stake! We assume Blueprint Gaming have taken inspiration from the Big Bet option in Barcrest slot machines as one of the options you’ll have below the reels is a big shiny ‘Epic Spins’ button which provides you with three staking options before enjoying a spin of the reels with increased odds of winning. These options are staking 5x your bet to remove the Queen, Jack and 10 symbols from the reels, a 10x option which also removes the King, and a 20x option which removes the Ace too. This means you’ll only be left with the most valuable symbols on the reels and you’ll be crossing your fingers to land a win which sees you recoup your stake and adds a hefty chunk to your balance! Online casinos are awash with online slots with a jewel theme and you may have thought Jewel Strike would just be another run-of-the-mill slot like the rest, but nothing could be further from the truth and a few spins of the reels will quickly make you realise that it’s a jewel of a slot. If seeing big shiny jewels puts you in the mood for more jewel-themed slots you should also check out the Cool Jewels slot from WMS and Jackpot Jewels slot from Barcrest in the hope of enjoying more dazzling wins!